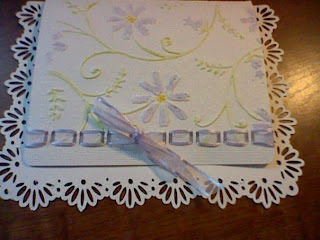 Sorry for the darkness of the picture, but these are the cards I made for my Mother In Law's wedding. The card is double embossed; I used Swiss Dots first then I used Stylized Flowers after then painted in the ink for all the invitations. Yes, you heard right my Mother in law is getting married again. My Father in law who's also featured on my blog passed away June 21st, 2008. My Mother in law said she'd never get married again. I guess God had a plan for her, because the man that he chose for her to marry is an amazing man that she and my Father in law had both known and had gone to church with. He's amazing in that he's a Christian just as my Father in law, my Mother in law and most of our family as well. I am and my husband are both Christians as well. I said all that to say that this man who's name is Ed House is a special man to her and special to me. I say that because as many of you know that my Father too has passed away, but his death was more recent. He passed away August 22nd, 2009. I miss him dearly ~ now why is Ed House so special you ask. I'll tell you why. He drives truck; my Father was a truck driver many many years over. He loved to drive truck and when my Father retired he couldn't stay away from driving because he went on to driving school bus. It was difficult for him when it came to retiring he loved those children so much ~ they were special to him and he didn't like to say good-bye. He didn't and many of the children were hurt and there was even one that wouldn't get on the bus because my Father wasn't driving. Also Ed did farming and has many farming stories to tell. I grew up on a farm as did my Father. I was raised with doing many things with farming. I may not have thought they were fun at the time, but I'm glad I had the experiences. I thought that it was great that Ed also had these as part of his life. When I talk with him I almost feel like I have my Dad close to me again. I'm not saying that I think that Ed is my Dad ~ what I'm saying is that my Dad at that moment doesn't feel so far away from me. I must say it's been difficult having my Father's grave so close to the house. Depending on the day or moment it can be a great comfort because I feel like he's close by to protect me if you will and other times it's difficult because I know he can't be there like he used to be. I know it's going to take time. I'm sorry for going on like that, but I just wanted to share the invitation that I made for my Mother in law and Ed; soon to be Father in law. I wish them all the best and many happy memories together in the years to come. I know they will because I've seen them out and about and they're too cute. My Mother in law is like high school girl in love ~ she gets all giddy when Ed's around ~ too sweet. I just love when they hold each other's hands ~ so sweet. I have something else that's very special that I'm making for them as well...shhhhhhh!!!! No telling!! (laughs to self) I'm keeping it a secret for now.